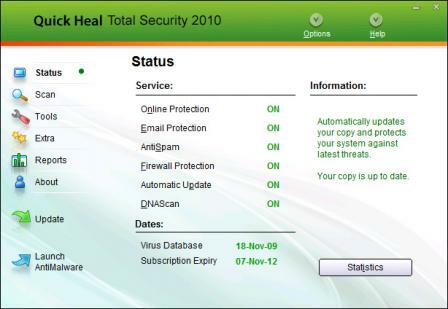 Quick Heal is a comprehensive software program that guards your computer and mobile phones from data theft and malwares. The program allows you to securely browse, shop online, bank online, chat to family and friends, and play games. After you install the program, it will guard your system against spyware, Trojans, worms, viruses, and all other damaging threats. The program is advanced enough to guard against unknown and new viruses via Quick Heal’s DNAScan technology, which blocks damaging websites and will go as far as to stop spam mail from entering your email box. The program uses very few resources thus your computer will not be slowed down so your browsing experience never changes. AntiVirus – searches for and rids your system of Trojans, worms, viruses and all other threats that may try to enter via internet downloads, attachments in emails, as well as removable drives. AntiSpyware – will block spyware from being installed on your computer without your knowledge, which can steal your personal information. The program goes even farther by guarding your privacy by the detection of finding and cleaning spyware while automatically blocking the identity theft activity. AntiMalware – an innovative search engine that scans files, folders, and registry to find and clean adware, spyware, dialers, rogueware, riskware, and other possible threats. Anti-Rootkit – finds ands cleans rootkits via an in-depth system scan, which will search the registry, running processes, and files for any suspicious rootkit activity that may be hiding in the system.